Once a year we dust off the Holy Trinity, have a look at it and then put it back on the shelf. Perhaps, we even tell ourselves. “Okay, next year, if I have the time, I will try to give it a closer look.” The mental gymnastics of trying to make three, square with one is just too demanding and off-putting. But asking, why three persons and not just one, may tantamount to asking “why is the sky so high”? Notice that we Christians have four gospels, not just one. One might have thought that we could have stopped with one, saying to ourselves, “Let’s just go with Matthew (for example).” But no, an effusive, ubiquitous and overflowing-with-love God requires at least four gospels to talk about God and Christ. So, merely speaking of God in a one-dimensional way would certainly be presenting an impoverished idea of God. One of the church fathers said, “When we talk about the Trinity, we must forget how to count.” He was simply recognising that, at first glance, the Trinity is a mathematical impossibility. After all, how can one equal three? We must throw away our math, not because the Trinity is a logical muddle, but because we need a different kind of logic. It took St Augustine, fifteen books to try to think about it, because God is God and we are not. Because God comes to us with a complexity and effusiveness, an ubiquity and a plenitude that boggle our modest minds; it is no wonder that we have trouble thinking about God. No wonder the Trinity boggles our imaginations too. I am sure that is probably the right way to put it. The problem with the Trinity is not that this is a bunch of nonsense, but that God is God, and in God’s particularly glorious, mysterious and effusive way, we the creatures and the recipients of a love so deep, cannot find words to describe it. When we think about the Trinity, we must forget how to count. I guess we can move pass the mental block of talking about so lofty an idea as the Trinity by not starting to think of the Trinity as some incomprehensible doctrine of the Church, though the mystery of God would always be beyond our comprehension. Think of the Trinity as our earnest, though somehow groping, attempt to put into words what has been revealed to us of the overflowing love of God. Christians are not those who believe in some amorphous, vague and abstract concept of God. Christians believe in a highly personal, interactive God who has chosen to reveal Himself to us as the Trinity. Christians are those who believe that God is best addressed as God the Father, God the Son, and God the Holy Spirit, all three are One, and we do so not because of mere speculation, but because this very God had intentionally revealed Himself to us in this manner. Christians don’t have to keep going back to the drawing table to come up with a new version of a deity that fits his personal taste. Any such deity would not truly be God, but an abstraction of our minds, made in our image and likeness. No! Christianity does not present a speculative idea of God but a God who has fully revealed Himself and now expects us to relate to Him and worship Him as Three Persons in One. It is true that when God came to us in the flesh, in the person of the Son, the Incarnate Word, God did not say, “Call me by my proper name, ‘Trinity.’” You don’t have to be challenged by skeptics to survey the Bible to come to the conclusion that the word “Trinity” can be found nowhere in the pages therein. Coming from someone who has read the Bible, many times, I can only say that they are right! The word “Trinity” does not appear at all. The reason is simple. God didn’t have to. We did. That is, on the basis of our experience of God as complex, ubiquitous and overflowing with love as the Father, the Son and the Holy Spirit, all three attested to in many verses in the Bible, we just naturally started speaking of God as Trinity. The Bible didn’t have to use the word “Trinity” but the Bible certainly spoke of God as three persons. Early on in his massive treatise on the Most Holy Trinity, St Augustine, the great Doctor of the West, had seven statements about God that could summarise his entire work. The Father is God. The Son is God. The Holy Spirit is God. The Son is not the Father. The Father is not the Holy Spirit. The Holy Spirit is not the Son. And then, after these six statements, he adds one more: There is only one God. In other words, Christians are not tritheists, we do not believe in three Gods as the Mormons do. Neither do Christians subscribe to some form of modalism – One God who appears in different forms, assumes different avatars, or wear different hats. The oneness of God is crucial to our faith. Not just as a concept but because it points to the way in which we are called to live. We are called to be one as the Father, the Son and the Holy Spirit are one. Each has their own distinct role in the godhead. So within the unity we also see diversity. As Christians who worship one God, Father, Son and Holy Spirit, we are called to reflect their life to the world. So the divisions in the church are not just a sin, they are a sin against the nature of God. The Trinity lives in a perfect community of love and we are called to grow together in love. Thus, the call to live in community is the call to reflect the love of God in whose image we are made. Love cannot be just an abstraction or a word. Love must always have its object. There must always be something or someone to love. It was not enough for the Trinity to exist alone as a community of love, sufficient unto itself. So it was out of love that the world was created in all its wonder and diversity. And it was love that called man out of nothingness and placed him as the crown of creation, granting him the very spark of divinity, the ability to freely choose whether to accept that love or to reject it. Love is part of our DNA. God the Holy Trinity didn’t create the world like a wind up clock and set it on its way, whilst watching from a distance. God continues to love and to involve Himself in creation, with and sometimes despite our help. God is constantly reaching out to the world, drawing it to Himself. This was the mission of Christ and continues to be the mission of the Church. A Church that doesn’t reach out, that does not draw in, is not a church formed by the effusive Trinity. Likewise, a Christian who doesn’t want, in love, to go out and tell somebody is not one who is formed by the relentlessly reaching out and drawing in that is the Trinity. Each of us too, as members of that Church, have a fundamental duty, which is in our very nature, our very DNA, to reach out to others and draw them into the communion with Christ, and through Christ, into communion with the Father and the Holy Spirit. This is mission of evangelisation. Thank God that our relationship with God is not dependent upon us taking the initiative. The Trinity refuses to leave it all up to us. In Jesus Christ, through the promptings of the Holy Spirit, in the wonder of creation that bears the permanent imprint of the Father Creator, the Trinity keeps reaching toward us, keeps leaving hints for us, indications that we live every moment of our lives upheld by a living, resourceful and ever out-reaching God. If we are to be true to our calling as Christians we also need to learn more about the Trinity. 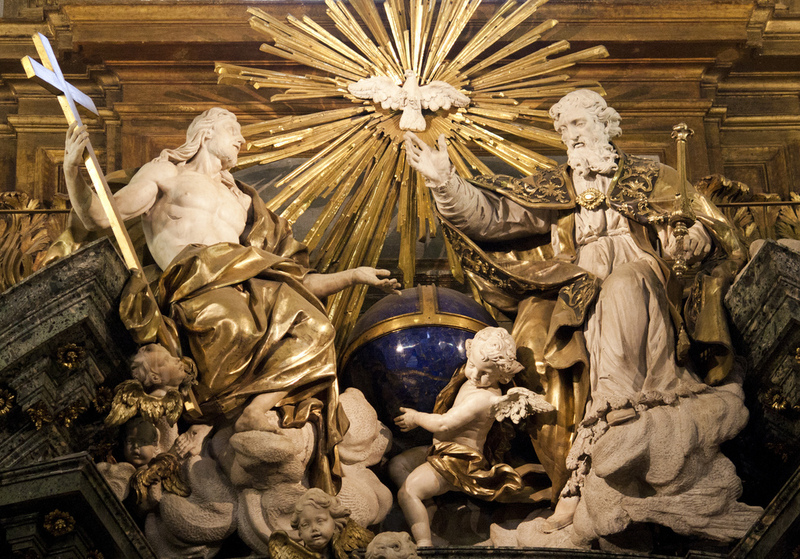 Not just once a year on Trinity Sunday, but in a way that infuses the whole of our faith; so that our lives reflect the life of the Trinity, so that it affects the way we live as Christians. The Fathers of the Church were right when they told us to stop counting. Yes, when we think about the Trinity, we must forget how to count – we must remember to start loving.